Mindfully transitioning from one pose to another is key in yoga. For example, when we move from child’s pose to downward dog, we first come onto all fours, curl the toes under, then lift our hips towards the sky while pressing through the back of the thighs and grounding through the hands and the feet. Of course we don’t have to take this particular route, but that transition gets the body to where it needs to be in a way that is safe and natural. Being mindful of how our bodies transition during the fall months is important, too. Throughout October in the Northeast, more specifically in Jersey City, we are transitioning from the hot, humid summer months and into the cold, dry weather of winter. As a result, the cool, dry air of autumn can affect us and increase our need for warmth and moisture. So as the environment around us changes, it’s important that we give our body food that supports us during this time. 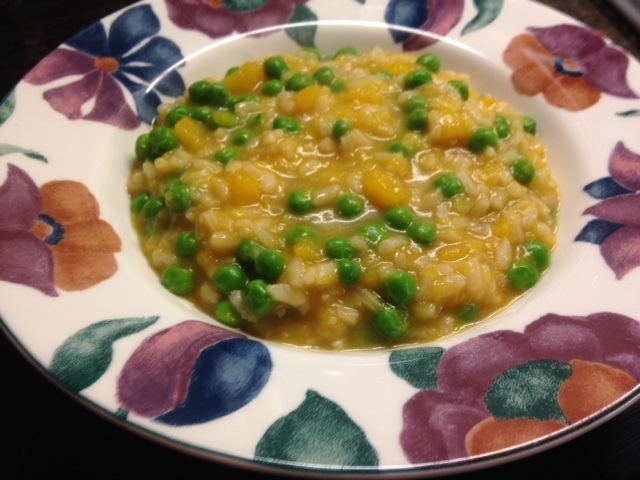 This recipe for butternut squash risotto is perfect for this time of year. Not only is it a warm dish, but it has a creamy consistency without added dairy. And with butternut squash being in-season right now, you have every reason to give it a try! Steam butternut squash until soft. Mash with fork and set aside. Over medium heat, add olive oil to pot. Add minced shallot and stir. After 1–2 minutes, add rice. Continue to stir until rice becomes translucent (3–5 minutes). Next, add white cooking wine. Stir until wine is absorbed. Then begin adding vegetable broth, a half-cup or so at a time. Continue to stir. Incorporate butternut squash into mixture. Continue to add broth and stir until liquid becomes absorbed. Finally, stir in frozen peas. Serve with a sprinkle of black pepper and/or parmesan cheese. I hope you enjoy this recipe as much as I do. Let me know what you think! Email me at jessica.namit@gmail.com or check out my website at jessicanamit.com.